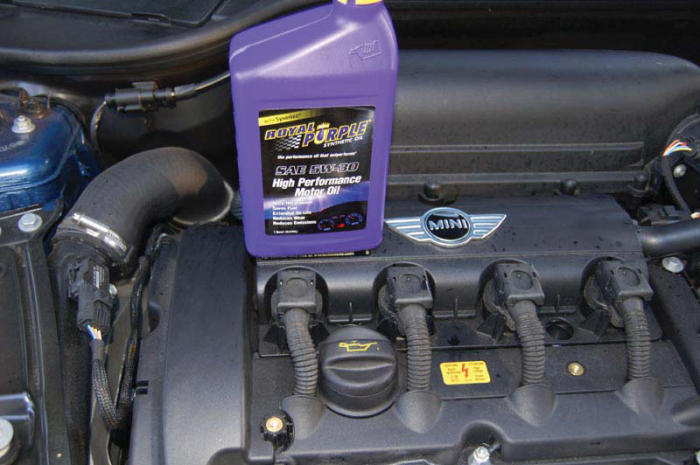 Welcome to Detroit Tuned’s how-to guide for an oil service for an R56 MINI Cooper. It’s always best to do an oil change on a hot engine as the hot oil will drain better and give you a more complete oil change. Caution must be used to prevent burns from hot fluids. Rubber gloves, work gloves, and safety glasses are all recommended for this job. 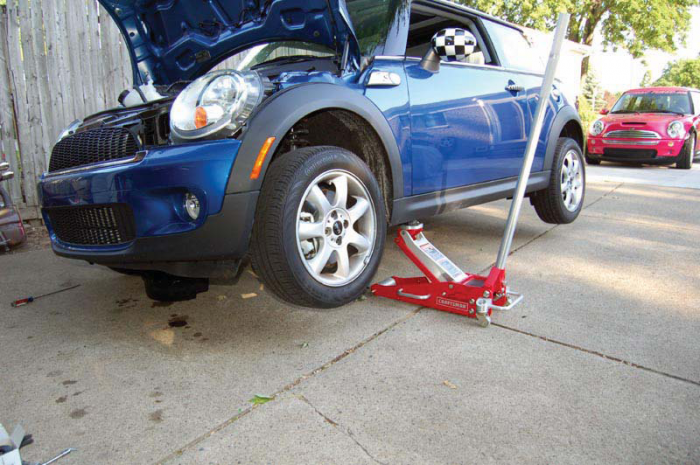 Any time you are under the car, a jack stand must be used. You should never rely on just the jack to hold the weight of the car up while you are under it. 1. Park the car on a flat level slab of concrete, set parking brake, and open the bonnet. 2. 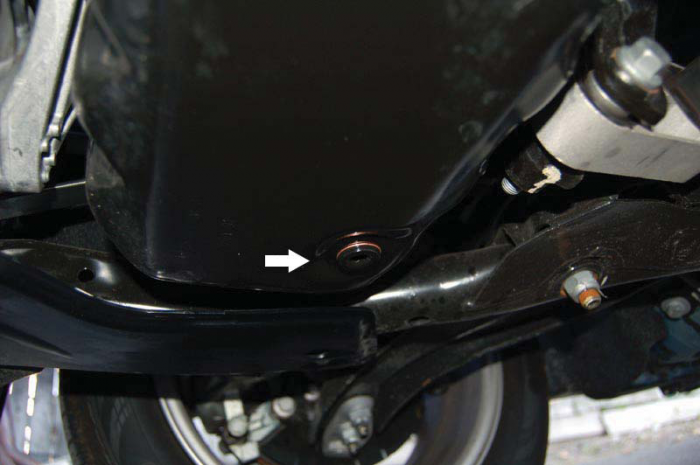 Remove the 8mm bolt holding the coolant expansion tank in place in the lower front part of the engine bay on the driver’s side. 3. You can then swing the bottom of the tank out and then pull up, and it will come off the posts that it is sitting on. Lean the tank towards the center of the car without disconnecting anything. You can now see the oil canister. Use the ½” drive and extension w/ 27mm socket to take the load off the canister and spin off till the o-ring is unseated. Do not remove it fully from the engine yet. The filter is full of oil and it’s best to let it drain back into the system. 4. 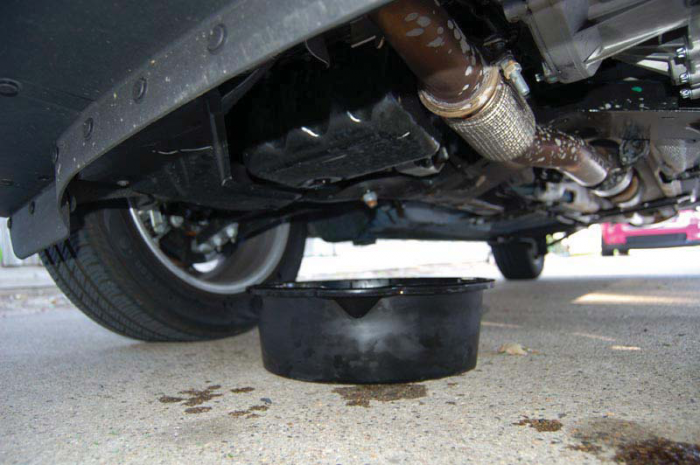 While the oil filter is draining, you should jack up the car to drain the pan. 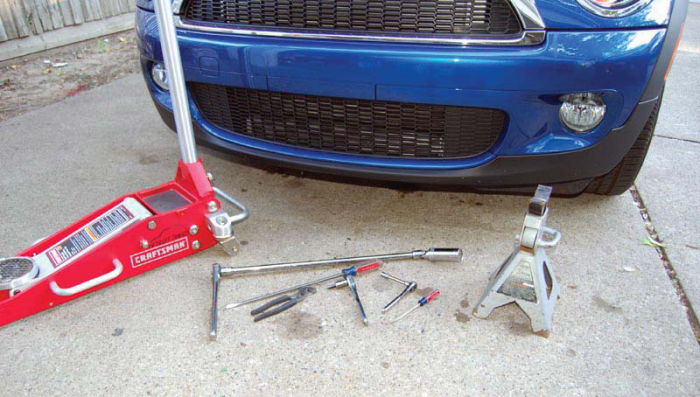 Remember to use jack stands whenever you or anyone else is under the car. 5. Place a pan under the drain plug to catch the old oil. 6. On the bottom of the oil pan you will find the drain plug. You will need the #8 Allen wrench to take it out. 7. The copper crush washer should come off when you remove the drain plug. It will be replaced with a new one that will be in the oil filter kit. Sometimes this can stick to the pan and a few hits with a screwdriver will make it come off. It’s important to not get more than one washer under the plug so that everything seals correctly. In the photo below, we are using a #8 allen socket on a 3/8” ratchet drive, but we have found an allen wrench to be much easier to work with. After about a turn, oil starts to leak out, so the allen wrench is a bit easier to hold and clean up. Be careful not to let any hot oil splash on you. After the oil is drained replace the plug with the new crush washer and tighten down to 25 Nm (18 ft. lbs or 221 inch. lbs.). 8. Lower the car and remove the filter. 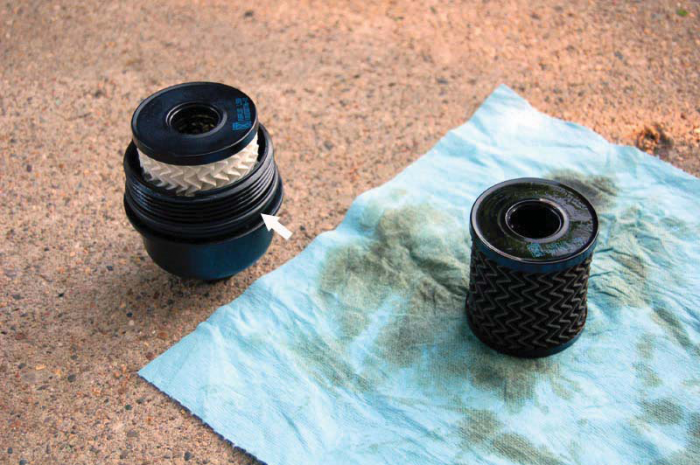 Clean out any grit that may be left behind in the oil housing so that the new filter has a good place to seal. 9. 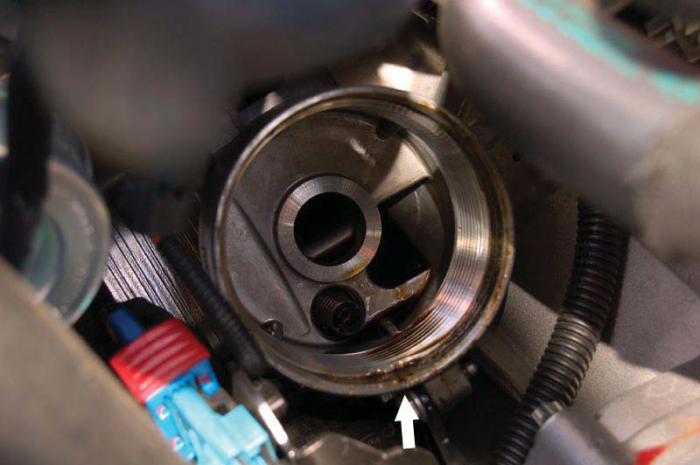 Properly dispose of the oil filter and remove the o-ring from the canister. 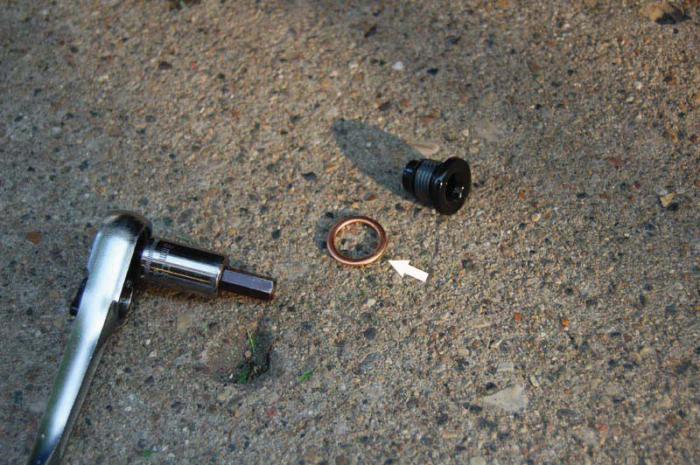 Clean up the canister; add the new o-ring and the filter. Be sure to pre-lube the o-ring with fresh oil before you put the canister back in the housing. Start it by hand to make sure you have proper thread engagement, and then tighten down to 25 Nm (18 ft. lbs or 221 inch. lbs.). 10. Reinstall the coolant expansion tank back onto the posts and then swing the bottom back in. Make sure the bottom stud has found its rubber grommet as shown in the photo. Reinstall the 8mm screw and tighten down. 11. 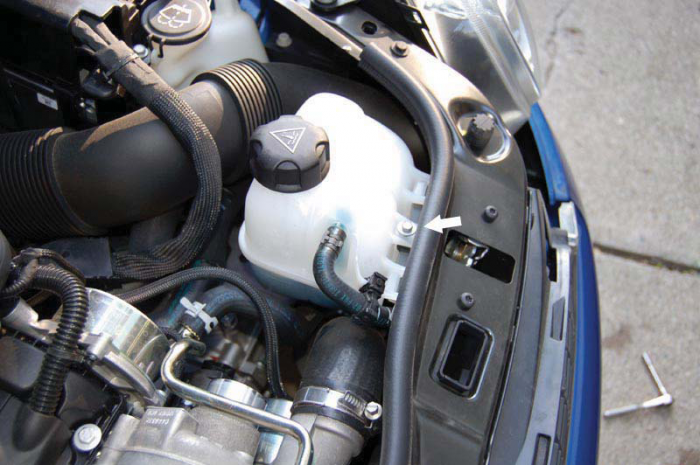 Fill the engine with 5 quarts of synthetic motor oil and replace the oil fill cap. Start the engine, let it run for a few seconds and then turn it off. This will allow the oil to fill the filter, which will allow you to check the oil level correctly. 12. Here you see the very hard to read dipstick that MINI has once again given us. 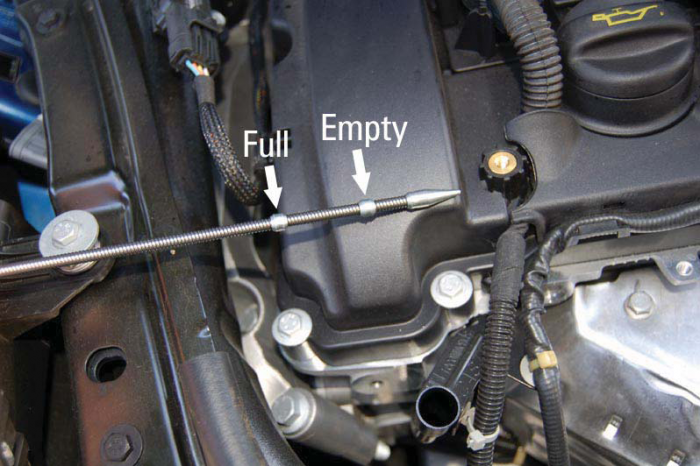 For the first pull you should just wipe off the dipstick and put it back in to get a correct reading. Pull it back out and keep the tip pointed down so oil will not run back up the dipstick. Your oil level should be on the full mark, if not, add more oil. The longer you let the oil drain, the more you will have to add. Here’s a tip, some times the dipstick is very hard to see where the oil level is. Take a paper towel and rest it against the side. This will show how far up the oil goes. The final step is to make sure all oil that may be dripped or spilled on the ground or motor is wiped up. 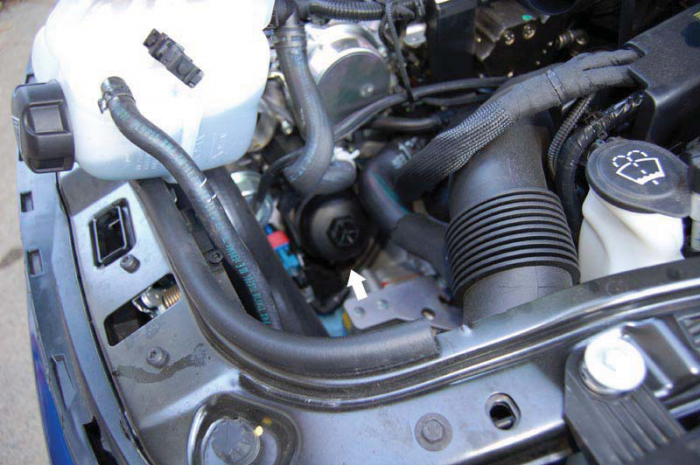 It’s much easier to see any oil leaks when all oil is wiped off should one occur. Oil will also attract dirt and make working on the car later much harder and make more of a mess. Make sure you dispose of the drained oil in proper manner. Many auto parts stores will recycle used oil, and many cities also have a community recycling center where you can take used fluids.